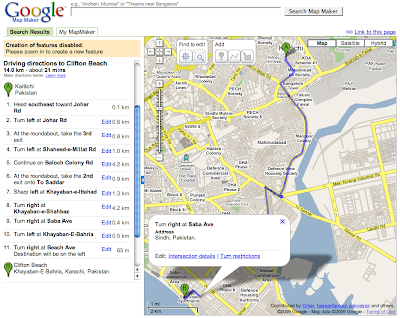 Google Map Maker, you can get driving directions in regions where this was not previously available. For example, you can get directions from Ho Chi Minh City to Thien Hau Pagoda in Vietnam or Pune City to Khandala in India. In the spirit of Map Maker, you can correct the directions as appropriate. Note that for every turn in the directions, you can edit the intersection details such as name and whether turns are allowed or not (known as turn restrictions). We're pleased to note that the directions seem very good in many examples we tried out, but there is always room for improvement. Also, finding directions is a great way to fix roads on the map that are broken, incomplete, or not connected well. For example, directions are incomplete for Devanahlli to Bommavara in Bangalore, India. This is because the road connecting Bommavara to a nearby main road is not drawn on the map. We have created a little guide to help you use the new feature. Our hope is that with this deep editing ability, we will be able to ensure the most up-to-date and reliable maps ever. Over the past few months, users have created rich and comprehensive maps in 164 countries around the world. Today with our newly launched feature on Google Map Maker, you can get driving directions in regions where this was not previously available. For example, you can get directions from Ho Chi Minh City to Thien Hau Pagoda in Vietnam or Pune City to Khandala in India. In the spirit of Map Maker, you can correct the directions as appropriate. Note that for every turn in the directions, you can edit the intersection details such as name and whether turns are allowed or not (known as turn restrictions). We're pleased to note that the directions seem very good in many examples we tried out, but there is always room for improvement. Also, finding directions is a great way to fix roads on the map that are broken, incomplete, or not connected well. For example, directions are incomplete for Devanahlli to Bommavara in Bangalore, India. This is because the road connecting Bommavara to a nearby main road is not drawn on the map.